Click to viewAfter the Guardian did their own investigation into the Mac clone maker Psystar yesterday, we decided to take it a step further and see if they actually exist, in the physical sense. How could a company so brazenly challenge Apple and have little to no record of actually being a company? We sent the Gizmodo army down there to get pictures of both their supposed addresses, and found that they're as much vaporware as the Phantom Console of yore. Read on for the details and location pictures. Mac Clone Maker Psystar Examined: Who Are They And Why Are They So Shady? First, let's revisit what we already know. Not only does the Miami Chamber of Commerce and BBB not know anything about any company named Psystar (confirmed by reader Travis through his contacts in the chamber), the actual physical address they listed on their website actually changed halfway through the day yesterday. What's going on here? Did they all of a sudden move from a home business into a new office space? Nope. Here's the deal. Reader Michael went down to their first location, address courtesy of the Guardian's quick fingers, and saw that it was indeed a residential address. It's a one story house with a truck and sedan out front. Not a business, but still holds the possibility of being a small home business. Still, unlikely. Why would they change their address? Perhaps they saw all the reaction they were getting about their Open Mac products and wanted a bigger space? Nope. 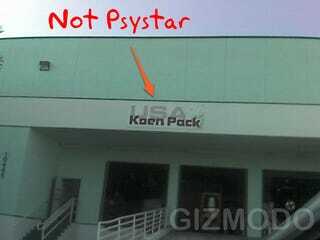 Reader Kahri visited their second location and saw no Psystar, but a packing supply company called "USA KOEN PACK." Was Psystar leasing the place? No. He spoke with the manager, and they've never heard of Psystar, and USA KOEN PACK has been at that location for the last two years. KOEN PACK actually takes up from 10481 to 10490, so there's no chance of it being a mistaken address. Update: Looks like Psystar's changed their address once again to 10471. Thank you for visiting Psystar. We're sorry but the store is temporarily down due to the fact that we are currently unable to process any credit card transactions. Please send an e-mail to support@psystar.com with the subject line "UPDATE" so that we can update you when the store comes back online. For customers who have already placed orders: if you received a confirmation e-mail then your item is in queue to be built and shipped. Here's our recommendation. Don't buy anything from Psystar now until we can clear this up. We've contacted them for more information and a review unit too see if everything they're claiming is real. So far, no response. We'll keep at it, but for now if you're looking to get a Mac clone, you're better off building it yourself. Thanks to Kahri, Mike and Travis! Update: Reader Robert did some more digging in the Florida Corporate filing office, and it seems that Psystar's principles are Rodolfo and Roberto Pedraza, who are officers or agents on a whole crapload of companies. Only one of these companies besides Psystar is currently active: Floridatek. As Robert says, "These guys are obviously clowns." Update 2: Someone just brought up the point that he could actually work at USA KOEN PACK and is just using his workplace as an address. Interesting possibility, but somewhat unlikely. Update 3: Ha! It looks like Psystar changed their address again. Here are their first two: image. Their third one is below. Update 4: They've changed the address for a third time! Thanks Wild Homes. Update 5: Reader Joe poked around the FloridaTek site and it seems that a bunch of links are just links to an automatic download of an executable file. Phishing? Watch out. Hey folks, I went back yesterday to check their new address 10471 (today it's 10475). Really whether it's 10471, 10481 or 10475, it doesn't mean anything because it's all the same big warehouse building which covers the block between 104th and 105th. Update 8: Reader Greg dug up this find on their current address, 10475 NW 28th Street, which was once for sale for $5,990,000. If this really is them, then they're occupying a $6 million building. Update 9: Another reader went to visit 10481, the first address listed, and found that KOEN PACK actually isn't the company there (it's to the left of it). 10481 belongs to a company called cotton images. What's interesting about this is that the cotton images guy actually KNOWS Rudy Peraza, and Rudy worked for them in the past. This explains WHY Psystar used the 10481 address first (because he worked there), and why he had to change the address so suddenly. Are they really renting out 10475, the current address? It's hard to say. ZDNet seems to have some clear pictures of that unit, but our reader below went to 10871 to scope it out. "Scott", who told me his wife owns the cottonimages.com business. cell phone and called someone. being renovated for a new tenant. changed yet again the following day. their address and expected to find a small store with products to sell. other business I deal with. Update 10: Our scout Kahri says that he's going to scout out 10475 and see if there's any existence of Psystar being there. He says that it's possible Psystar has just acquired that side of the building, but hasn't put up signage yet. Check back later for pictures and info. Update 11: This doesn't really serve any use except for curiosity's sake, but here's Psystar's weblog stats. Thanks tipster! Update 12: It seems like credit cards are starting to get billed? Reader Yariv sends in this super weird credit card statement of tons of $9.99 charges that supposedly add up to $399. We're not sure about this one. There's nothing there that ties these charges to Psystar. Has anyone else purchased a machine and gotten billed for it? Let us know. My email's on the left side of the page. Hopefully we can either confirm or smash whether cards are being charged yet. See Update 14. Update 13: This is a big find. Kahri just went down to Psystar and took this shot of their window. This is the first indication that Psystar actually exists at that location. Amazing! Update 14: Reader Derek says he didn't have any strange anomalies with his order, and was billed for the exact amount listed. He also received a call from a 305 number (Miami), that asked him if he wanted to purchase a separate OS because he ordered his machine without one. Anyone else receive their shipping notification yet? Email me if you have. Update 15: Here's Psystar's official picture of their logo on the door. Looks good! But not open to the public.